And after last years horrible cold and unpleasant summer, I am spending this year's vacation in Croatia. Was + 29 degrees Celcius in Dubrovnic yesterday. No computer on this trip, except the one in my cellphone. My new cellphone. Hmm, it has a camera, who knows, perhaps I should try some moblogging from the beach? Because that's the only type of blogging until I am home in the middle of July some time. And get my lap-top back. Yeah, it's not here and I have been suffering withdrawal for a week. That's how it is. Ta kontakt når som helst hvis du oppdager faktiske feil eller et sitat som har blitt forandret til noe du kan stå for. Translated: Contact me if you see actual errors, or quotes that have been changed into something you can stand for." - meaning, if the quotes they use actually come out the way I meant them to do. Considering some journalistic practice, this typo was if not revealing of the true intentions of the writer (who did, correctly and as I asked, send me the quotes), at least funny in a disillusioned teacher kind of way. I just discovered that my not-yet-published article has already been quoted online, something I guess bodes well for it. The correct citation would however be: Mortensen, Torill (forthcoming). "Of a Divided Mind: Weblog Literacy" in Leu, D., Corio, J., Knobel, M. and Lankshear, C. (eds) (in process). The Handbook of New Literacies Research. New York: Erlbaum. It's been a tough year. Since just before the Women in Games conference in Dundee I have had a problem with my throath, voice going when ever I have to talk much. At first I thought it was just a lousy immune system, and that I picked up every bug going around, more efficient than an air filter. After one or two weeks of intensive lecturing, enclosed in lecturing halls with classes from 20-150, it would be a miracle if I did not come down with the strain. Then I thought it was the travelling, as I tend to come down with a cold the day after I have been somewhere to lecture. When I got sick in the middle of a period of no travel, tucked in my own house, after a meeting including a day of talking to only one healthy person and not 150 students, I started to suspect something else. Today I am actively resting. I have spent the weekend interviewing players, then one day in a meeting, talking, two days doing oral student assessments and one evening having dinner with and chatting and laughing with Jill and Scott. Now my throath, mouth, jaw, ears, nose, all of it either hurts or itches, and I want to call my doctor and ask if he can hurry up the specialists, I want to figure this out, and now. Apparantely, singers and teachers have something in common: we tend to strain the vocal cords. This can either be helped by training: learning to relax, ease the voice into a more comfortable register, new techniques of projecting, or it can be helped surgically, by removing the "knots" on the cords. I hope it's all psychosomatic, or just a bad cold. I'd rather face my fear of talking in public than the terror of a knife - even a lazer knife - in my throath. I can report that the rumours are true: Gamers can be dragged away from their computer screens, they are able to interact socially, and what's more, they don't turn to stone, evaporate in a flash of blinding light and turn to dust OR just fall apart when exposed to sunlight. 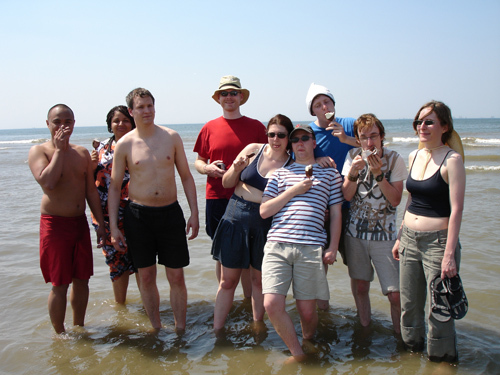 Here's the evidence, a bunch of geeks on the beach, so many research subjects in one spot on a Dutch beach, I am dazzled! Did you ever ask yourself where Tetris comes from? I did, today, and the net answers. Or you can check Wikipedia. Who would have thought that such a simple game would have such a complex history? Deals made and broken, patents lost, influenced by the fall of the Iron Curtain and bought by Microsoft way back before they cared about publicity. Oh, the drama! If you really REALLY like Tetris, how about joining the Church of Tetris? I am not going there just yet, although Tetris was the first digital game I saw in my dreams at night. One way to download it today is through the BOWEP - Best of Windows Entertainment Pack. There are other cute, cute games there too, one of my particular favourites is Chip's Challenge. Enjoy. Go see what feministst do at femiknits. It reveals the truth! One of the discussions I was involved in at the MSR social computing symposium 2006 was why is working with games such a low-status activity, while working with literature is not. There are a lot of things around this question which annoy me, for instance why ask it at all, when we just need to look around us one or two times with our eyes somewhat open to see that there is a long list of very important human activities which receive absolutely no attention or status. How many of us really listen with interest when people discuss trash removal and disposal, and wish to share the experience with our local garbage man? And what should we do if nobody cared? We are pretty priviledged, us game researchers and designers, we are high profile in the news, get to sit in a clean neat environment and do a complex creative job where we have everything to gain and can not do all that much harm. Compared to the dangers of toxic waste, I think the dangers of badly designed games are insignificant. The other problem I have is: What you mean, games have no status? Look around you! Sports dominates the news in all mainstream media. Football, American Football, Baseball, Basketball, Golf - it is all games. Games are heavily analysed both in the mainstream media and in literature. I would love to see a comparison between literature written on Chess and literature written on the plays of Shakespeare. I am not confident the bard would come out on top. And if you count international news coverage, Chess have columns in large papers all over the world. It is in most cases more regular and delivers a better quality of analysis than the book column. Computer games are in the news all the time. They get attention at a level which can compete with other new media changes and inventions since the turn of the century, they are also extremely widely used. Compare with the speed of the market penetration of television, computer games have become ubiquitous in ten years. So your mother doesn't go "Meet my son the brilliant game designer" in order to impress the mothers of physicians and best-selling authors, but that's because your mother isn't a gamer. The truth is, a lot of mothers are not interested in literature either. Or research. There are still people who think disposing of the trash in a regular, professional and safe manner is more important than writing deep and penetrating pieces of literature - which nobody reads anyway. They admire carpenters who can build good houses to live in, gardeners who can make trees and flowers grow, farmers who can deliver good produce, primary school teachers who manage to teach and inspire. And so do I, matter of fact. I almost revere them.